Conservationists in Bolivia are scouring the country to find a mate for a childless frog who they fear may be the last of his species. Romeo, a 10-year-old Sehuencas water frog, has been calling in vain for a mate for the past nine years. A dating website donated to the search, and even gave him a profile that says he is “looking for my Juliet”. Scientists are now searching streams and rivers for a female with whom a breeding programme can be started. “We don’t want him to lose hope,” Arturo Munoz, a conservation scientist, told AFP news agency. “We continue to remain hopeful that others are out there so we can establish a conservation breeding programme to save this species,” he said. But conservationists will have to be quick, as Sehuencas water frogs don’t often live beyond 15. 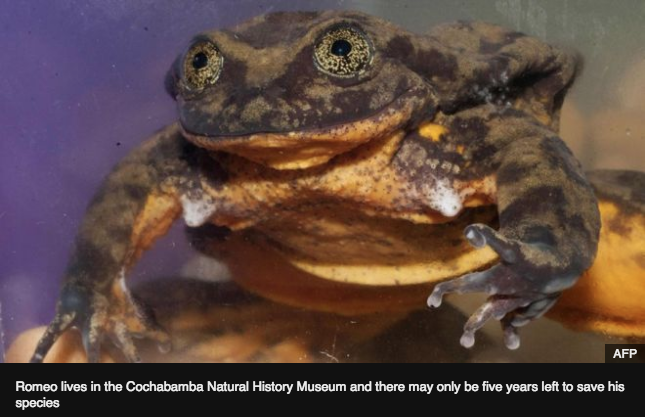 That means Romeo, who lives in a tank in the Cochabamba Natural History Museum, has around five years to save his species. 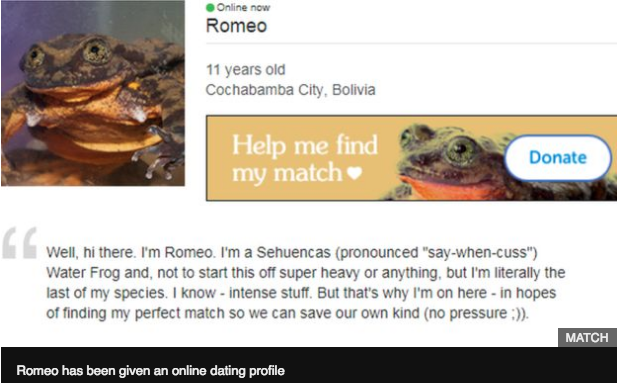 As part of a campaign to raise $15,000 (£10,800) before Valentine’s Day, the dating website Match created a profile for Romeo complete with a picture and essential information. “Not to start this off super heavy or anything, but I’m literally the last of my species,” the profile reads. This entry was posted in Bolivia, Cochabamba, Environment, Tourism and tagged biodiversity, endangered species, wildlife. Bookmark the permalink.